Our uPVC bow & bay windows aim to give your home the optimal amount of natural light. Energising your property with visually stunning, value-adding uPVC bow & bay windows. Our uPVC bow & bay windows stand out from your home to flood it with natural light. If you are looking for a stylish replacement for your old windows in your home in Brighton, East Sussex and the surrounding areas, then look no further. At A1 Glass and Glazing, we can provide you with beautiful bow & bay windows to compliment your home and ensure that you are benefiting from the optimum amount of natural light in your home. The way that our uPVC bow & bay windows extend out of your property allow you to feel connected to the outside world from the comfort of your own home. Our uPVC bow & bay windows have many design choices, so you can choose the one that is best for you. 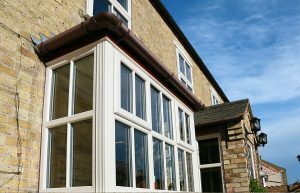 In order to supply our customers with the highest quality uPVC bow & bay windows for your Brighton homes, we know that choosing the right manufacturer is extremely important. We have chosen Deceuninck to manufacture our uPVC bow & bay windows. With extensive knowledge in this area, and products selling in over 75 countries, we believe that Deceuninck is the right choice for us and our customers. These uPVC bow & bay windows aim to improve your Brighton home’s insulation. The window design includes super spacer technology and triple glazing, which will contribute to the reduction of your energy bills. Deceuninck’s products have been awarded an A+ rating by the BFRC as a result of their energy efficiency and their contribution to the reduction of carbon emissions. It is important for us to highlight the improvement in insulation that your home will gain upon installation of our uPVC bow & bay windows. 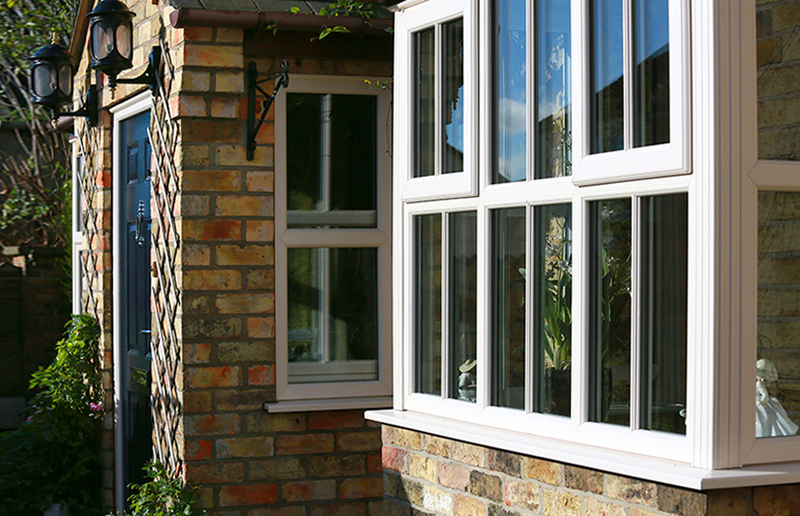 Our windows are built to combat draughts and condensation. If not taken care of, condensation can leave you with mould in your home, which is difficult to get rid of, unsightly, and not very good for your health. However, you can forget about these problems when you’ve got bow windows and bay windows in your East Sussex home. Our wide range of colours, glass and hardware options make our uPVC bow & bay windows just that much more appealing. You can choose a colour scheme ranging from White Grain to Anthracite Grey for your uPVC bow & bay windows. Depending on the architectural design of your home and personal choice, you can choose to have one colour on the inside of your windows and another colour on the outside. 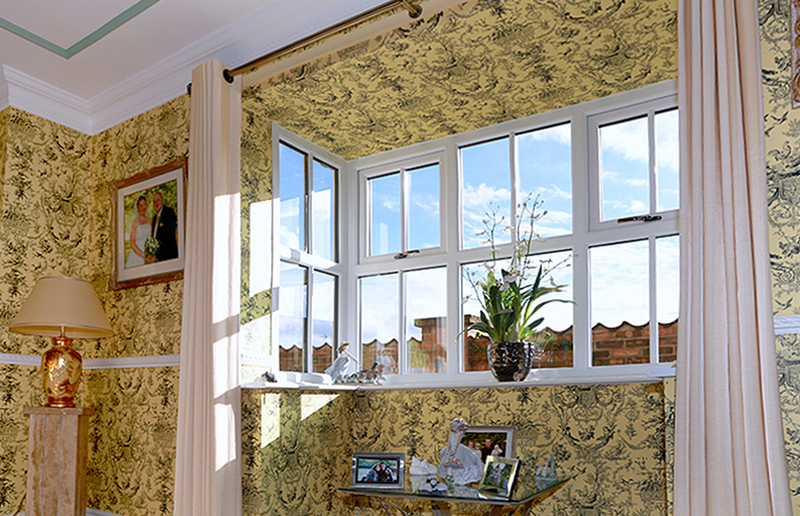 If your current windows have a square leaded or diamond leaded pattern that you don’t want to lose, then not to worry. Our uPVC bow & bay windows come with this hardware option as well as giving you the choice of adding internal or external Georgian bars. For added security, A1 Glass and Glazing can give you a range of glass patterns to choose from to help you feel comfortable in your Brighton home. Secured by Design is a scheme managed by the UK Police to ensure the safety of homeowners when purchasing and installing windows and doors. Secured by Design have set standards for products to comply with in order to be considered safe. Here at A1 Glass and Glazing, we are pleased to inform you that our uPVC bow & bay windows not only comply with their standards, but exceed them. Our uPVC bow & bay windows feature an integrated locking system, anti-snap cylinder technology and hinge protectors to resist forced entry. We aim to provide you with the highest amount of security so that you feel safe and comfortable in your home. We would like to encourage you to contact us if you have any questions or would like any additional safety information about our uPVC bow & bay windows. If you have any questions or would like any more information about our uPVC bow & bay windows then please call us on 01273 676750 to speak to a member of our team. We hope to provide you with as much information as possible to help you make the important decisions about installing your uPVC bow & bay windows. Please feel free to use our online design tool to generate as many quotes as you would like for your uPVC bow & bay windows. You can also fill in our contact form with your details for a member of our team to get back to you with more information about our uPVC bow & bay windows. We would also like to encourage you to explore our full range. We install products ranging from glass shower screens, through to uPVC French doors to conservatories. All of our products comply with industry level standards to provide you with the highest level of safety and comfort that we can. A1 Glass & Glazing are based in Brighton and cover most areas within East and West Sussex such as; Hove, Lewes, Worthing, Crawley, Horsham, Seaford, Haywards Heath, Shoreham-by-Sea & Peacehaven. If you would like to know if we carry out double glazing installations in your area, contact us today on 01273 676750. You can also use our quote system for an online double glazing quote so you can begin to plan your home improvements with us today. A1 Glass & Glazing (Brighton) Limited is an Introducer Appointed Representative and provides a pure client Introduction through Improveasy Ltd., a company registered in England and Wales (Co. Reg. number 7807352). Registered Office: Manchester Business Park, 3000 Aviator Way, Manchester M22 5TG. The firm is authorised and regulated by the Financial Conduct Authority (FRN 708623) as a Broker, not a Lender, and offers credit facilities from a panel of lenders. The credit is subject to application and status.